I picked this book up at the library without having searched for it. I was standing in the stacks at the small library in the town I grew up in, and the cover caught my eye. A bunch of pretty, old books? Who wouldn’t at least pick it up and see what it was about? (Yeah, I know — not everyone’s as book-obsessed as I am, but still….) Well, it turned out to be not only a really interesting read, but also a very compelling story. Bartlett’s writing style is captivating, and the tale of these two men — one incorrigible book thief and one driven book dealer gone detective — kept me interested throughout the book. One of my favorite characteristics of Bartlett’s book is the way she weaves book lore into the story of Gilkey and Sanders. She includes stories of other thefts, rare books, and histories as she tells the story of her interactions with Gilkey and Sanders, which makes the book much more rich and varied than I originally expected. Part of the appeal of this book, for me, was the subject matter itself. Reading about other people who are obsessed with books, and about these people who hunt for these literary treasures, was like reading about a part of myself that could come out if I would let it. 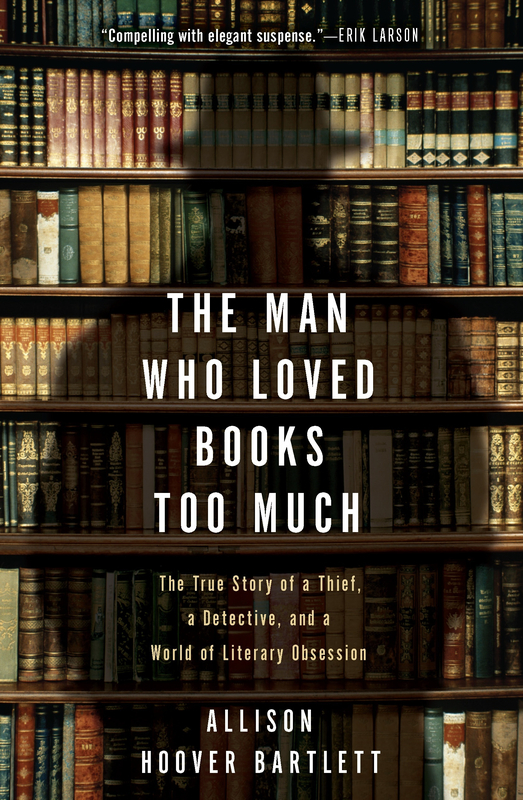 The magic of the rare books world really comes through in the pages of The Man Who Loved Books Too Much. For anyone who loves books, loves history, or loves a good mystery, this is definitely a good book to read. It’s lucky for me the local library had it featured on one of their shelves, the cover facing out for interested readers to see.